I finally got all the measurements of all motions of the pistons of the Robot as it walks along. This allows me to add up the volume change of each piston as it moves, and to total all these volume changes into a final total flow of fluid to the pistons of the Robot. The discussion below sets out the steps needed to be able to create an engine that would power the robot. Here I show a video of this engine that was designed to meet the output and pressure needs of the Pistonrobot. 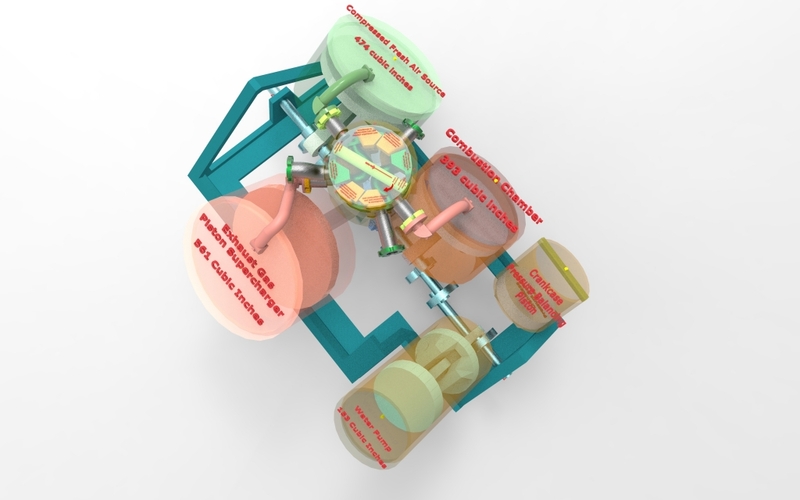 Here’s an image of this engine as a rendering from Sketchup. The walking cycle of the Robot is divided into a set of 22 stances. Thus, the Robot starts out with its weight on its right foot and begins walking along. 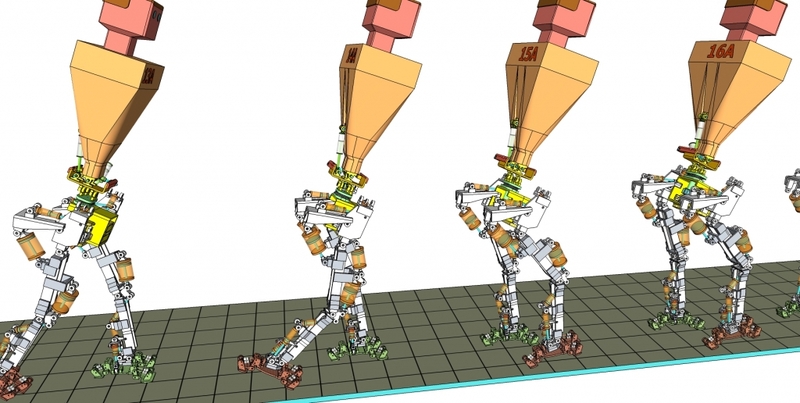 The sequence is that it moves its non-weight bearing left foot forward, then places its left foot on the ground, then transfers its weight to this left foot, then lifts up its right foot to make it now non-weight bearing, then transfers its right foot forward, then places its right foot on the ground, then transfers its weight off its left foot and back onto its right foot. 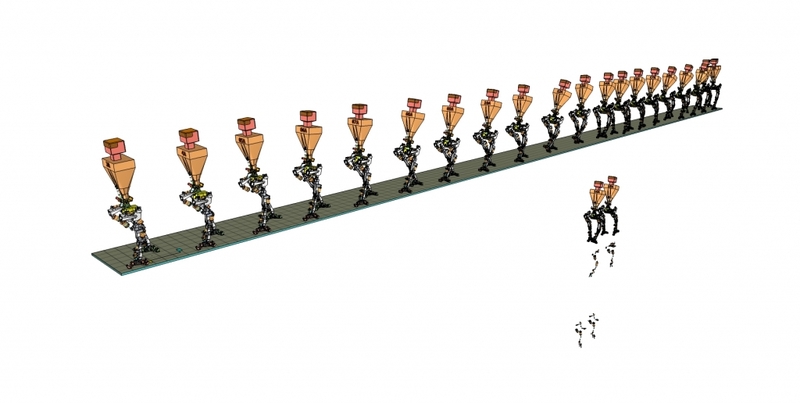 Thus a cycle of stances occurs and the robot “cycles forward.” By repeating this cycle of 22 stances the Robot can walk along. We cannot really establish a flow rate for the fluid going to the pistons of the Robot if we do not have a time parameter. This time parameter on the topic of walking involves a specification of: ?How fast is the Robot walking?” This parameter needs to be specified because there is no process or derivation method to establish the walking speed of the Robot. Basically, we just need to pick a walking speed by specifying it. As I thought about walking speeds, I felt the correct place to look would be the military use of walking as a basic military function. One nice feature of this approach is that the military has lots of research available on the topic of walking and a walking Army. So now we look at a walking Army where it is actually walking to get somewhere to do something (i.e. it is not doing ceremonial walking in a display type activity). This rate is about 2.5 miles per hour, unless something dramatic is needed. 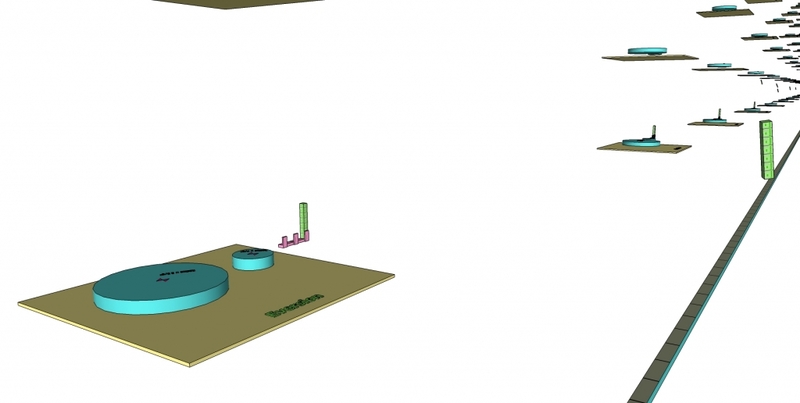 So we can set the Robot walking speed to 2.5 mph so it can just walk along with the Army, and this gives us a time interval value to use to set up calculations about what volume of fluid flow per unit of time is needed for the robot. 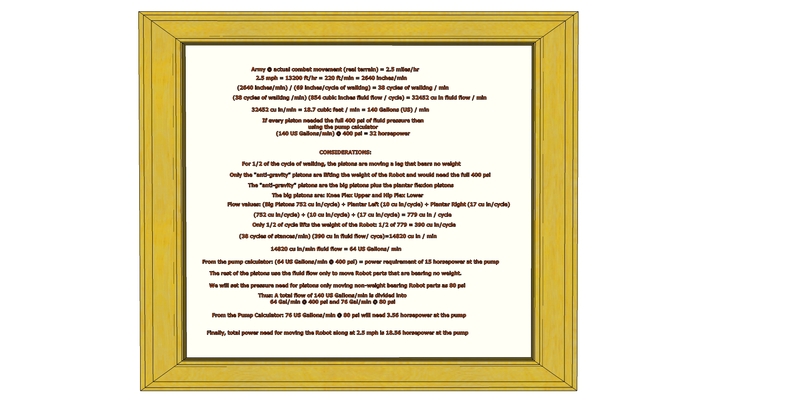 Once we have fluid flow with specified pressure and specified volume per unit of time, well….. that’s a pump problem. Our discussion at this webpage is really an educational exercise. 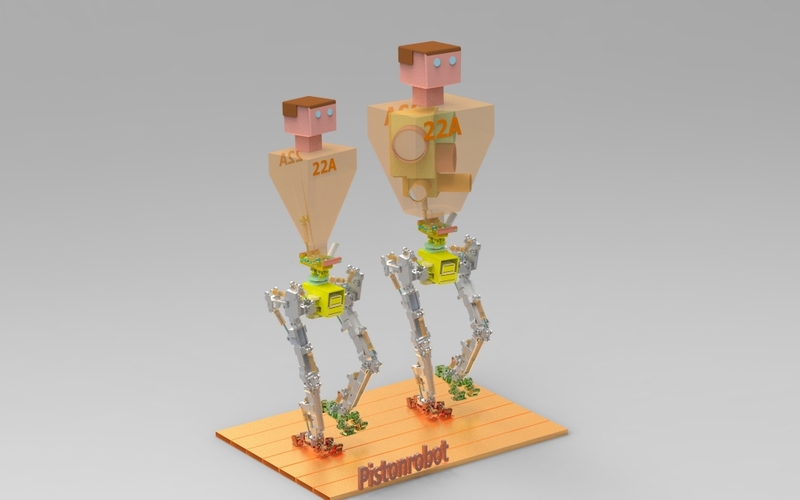 We are using the page to demonstrate how we can measure and define the parameters and values that will apply to the walking Pistonrobot. 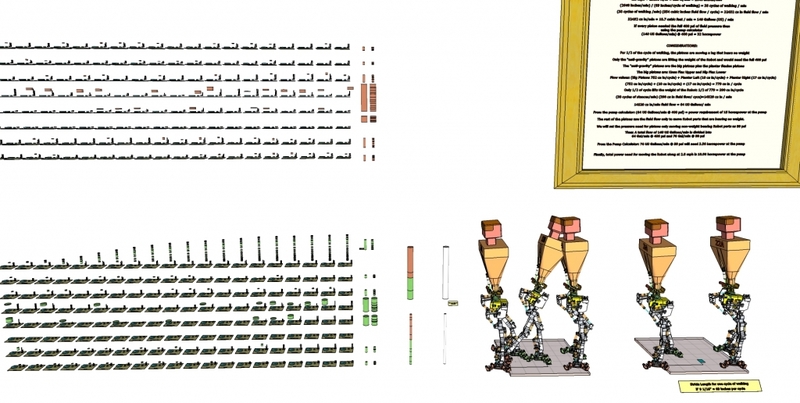 We use data and images derived from information in drawing files about the Robot. The drawing program we use is Sketchup, so I wanted at the beginning of this webpage to set out how these Sketchup files look and to give the actual files as downloadable items so you can work yourself with these files in your own copy of Sketchup. So what follows at the beginning here is a listing of some Sketchup files for download, and some pictures that show in an overall fashion what these Sketchup files contain in their drawing space. I will list the Sketchup file first, and follow this listing with the image file to give an overall view of what’s in the Sketchup drawing space for the file. 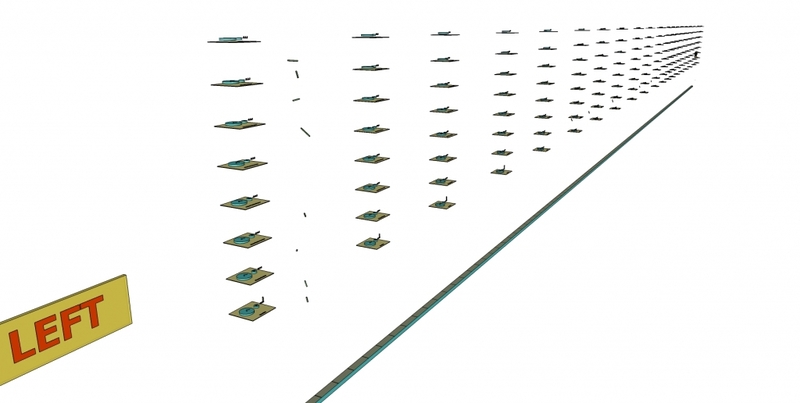 Here’s a picture that shows an overall view of what this Sketchup drawing file will show in its drawing space. Remember with these Sketchup files that they are drawing files for use by Sketchup. If you download these files, you will need to have the program named Sketchup open and running on your computer in order to open the file and work with it. I should mention that the Sketchup file named: “2017-02-09-robots-14a-and-15a-v4” is a truncated version of the files I used to get the fluid volume flow for the robot. It is my experience with Sketchup that Sketchup will “keep up” with everything that is present in the drawing. 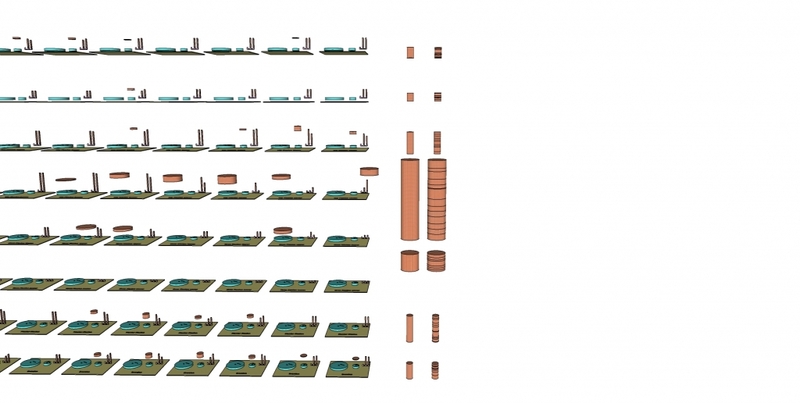 If one has a bunch of different structures as part of a drawing file, then every time one does anything with that drawing file, Sketchup will calculate the proper manner for Sketchup to display every item in the drawing file. The effect of this is that (unless you have an “ultra” computer) Sketchup tends to slow down and actually lock itself up because it is trying to keep up with too much. So with the Sketchup file named: “2017-02-09-robots-14a-and-15a-v4,” I took a bunch of items out of this drawing to make it run better and faster in Sketchup. This drawing was really only constructed so that I could prepare rendered images for the educational discussion that I put in the first part of this webpage. There are other bigger Sketchup drawing file that have more of the items needed to do the fluid flow calculations. 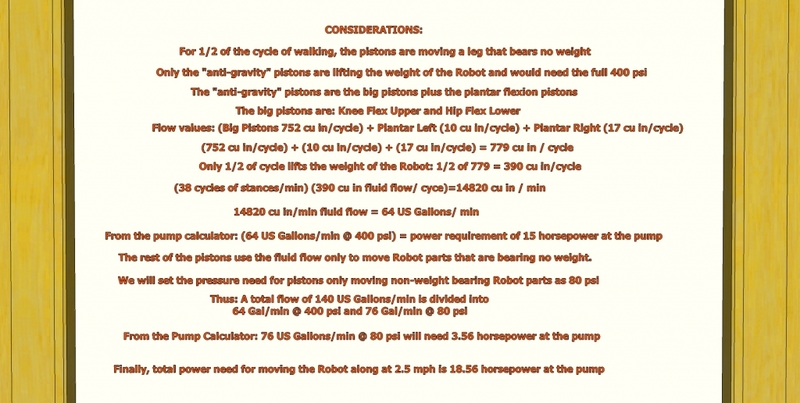 The actual calculation process of determining the fluid flow for the pistons of the Pistonrobot involves reference to a set of drawings that progress from the listing out of just the 22 Robot Stances by themselves through a progression of drawings to get the measurement parameters of the pistons involved. 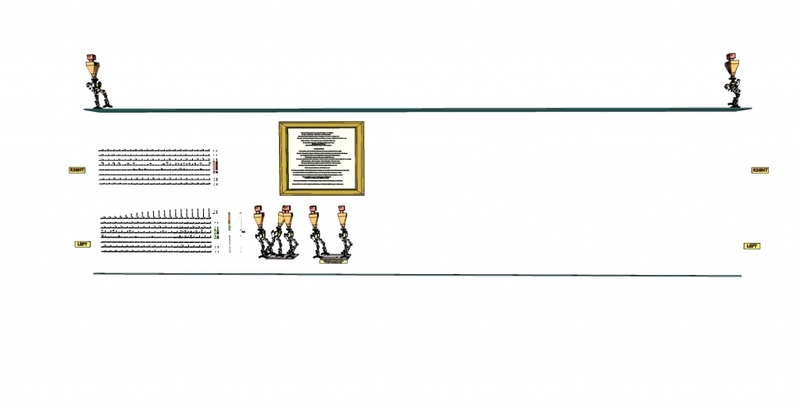 The procedure in the creation of this sequence of drawings is that as the sequence progress complex displays of multiple items that were needed in an earlier sequence are removed from the current sequence. The effect of this is to keep these drawing files from becoming so complex that no reasonable computer would be able to work with them. But I need to point out that, in order for you to completely understand what happened, it is my recommendation that you should download and open these drawing files one by one in their sequence so that you can see how the parts needed to do the measurements of fluid flow were sequentially added. Well, it was this rendering feature of Sketchup that was the creation process for these images. 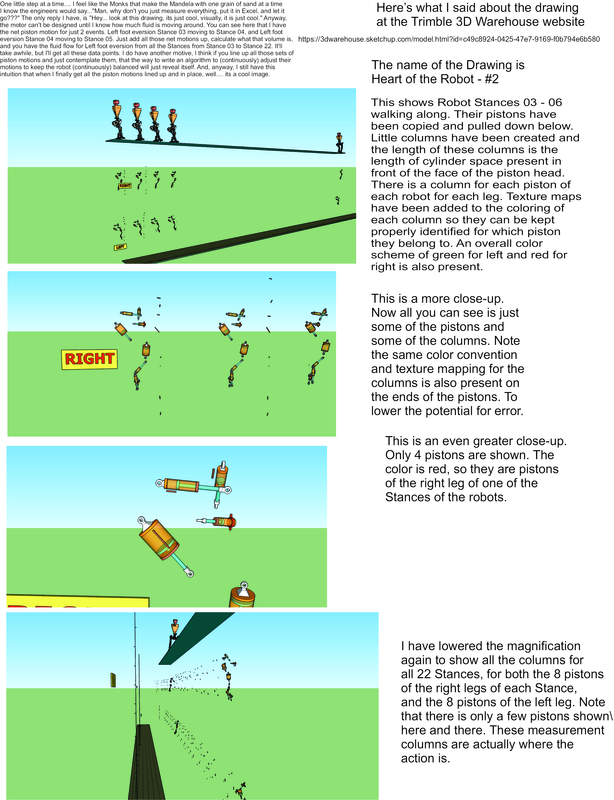 I thought before I got into complex discussions, I should show how we calculated the volume changes of the pistons as the robot walked along. 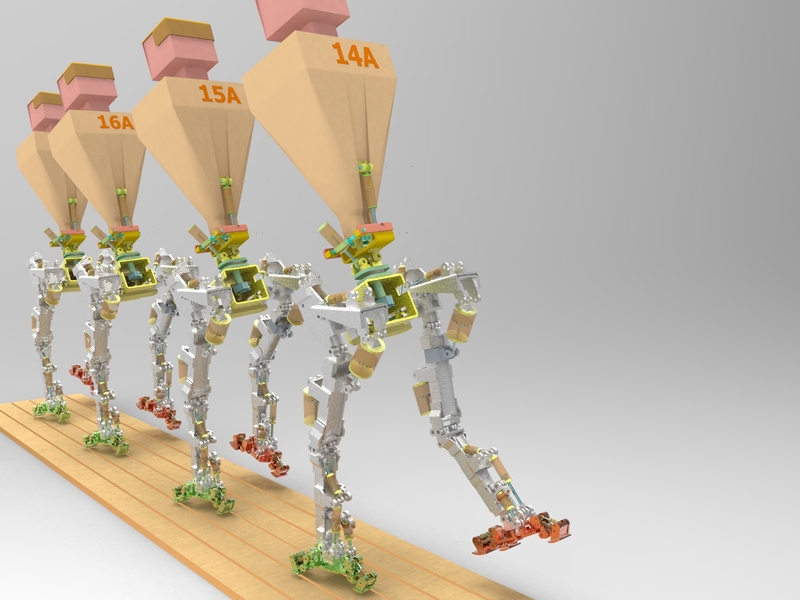 Here we show a more pulled back view of the various stances of the robot as it walks along. It can look like there are 22 robots, but there is only one robot, it is progressing along through these 22 different stances. I put on the back of the Robot’s thorax which stance it is. 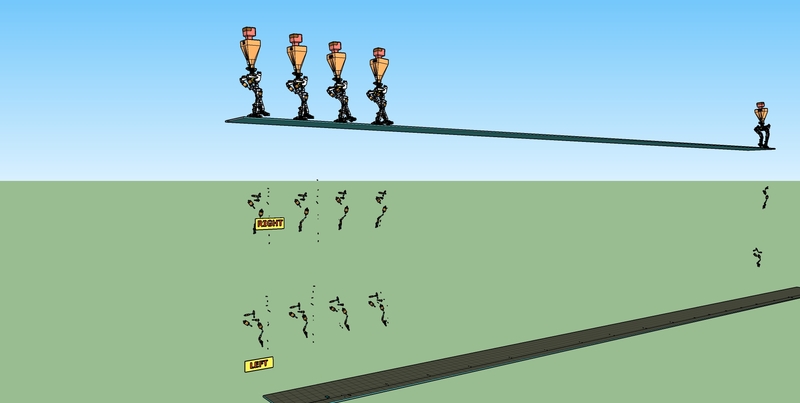 The stances actually start at 3A, so robot stance 3A shows the robot at the start of the walking sequence. Stance 4A would be the next stance that the Robot went to as it walked along. Now I am going to progress to a more and more close up view so we can see what is being measured. Robots 14A and 15A v4 14A and 15A close up Pic 03I wanted to demonstrate a piston motion volume calculation that was one of the bigger motions because it shows what we are doing more easily. So we are zooming down to Robot stances 14A and 15A because the right leg has a pretty big motion between these 2 stances. Here we want you to look at the right foot motion between stance 14A and 15A, that foot is swung forward for sure. 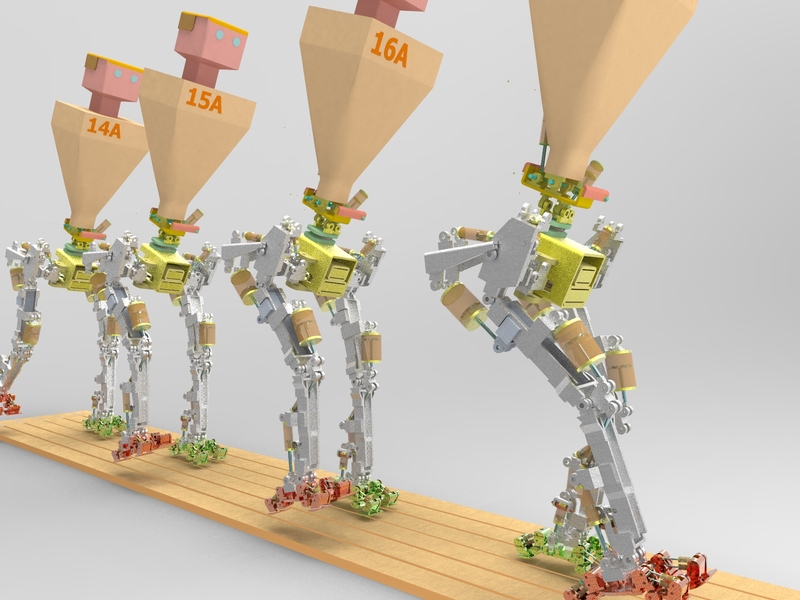 The robot stance on the far right is stance 15A, and the best way to show this is to keep focusing down on just one piston. 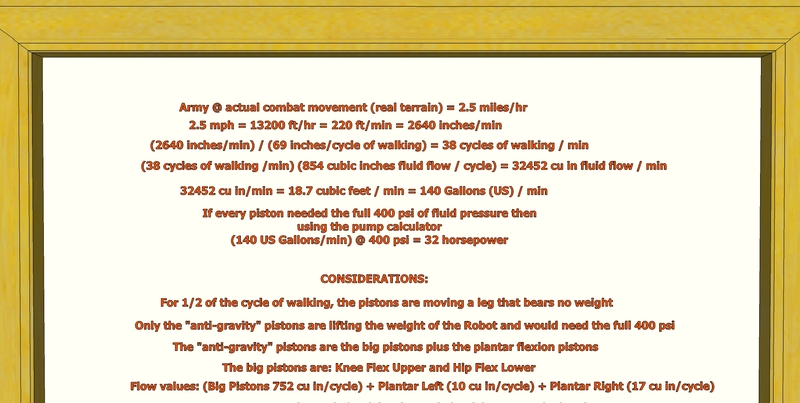 Once you understand what was done for that piston for that stance, then you can understand that all the rest of the measurements were just all the other pistons for all the other stances. So look at the piston that flexes the hip on the right leg. 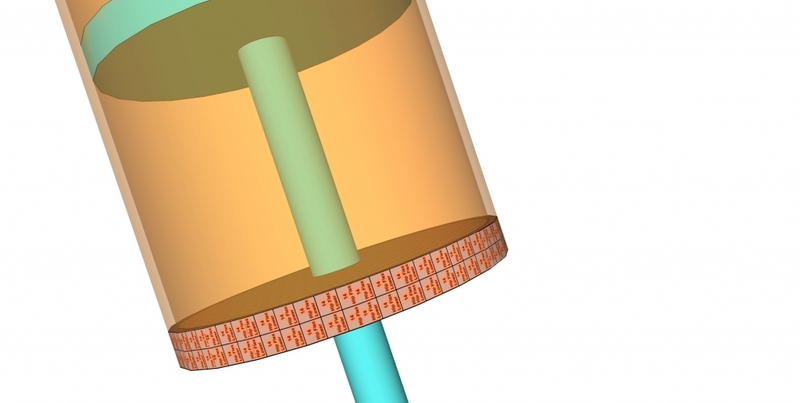 This is a large diameter piston because this motion is part of the anti-gravity motions of the legs. You need that large diameter so that the piston can generate enough force to overcome the weight of the robot and make the movement happen. Notice that in stance 14A the piston is up in the cylinder and for stance 15A the piston moves to basically fully extend the cylinder. The extension of that cylinder is what pushes the right leg forward from its position in stance 14A to its new position in stance 15A. So here is an even more closeup of the hip flexion piston of stance 14A. 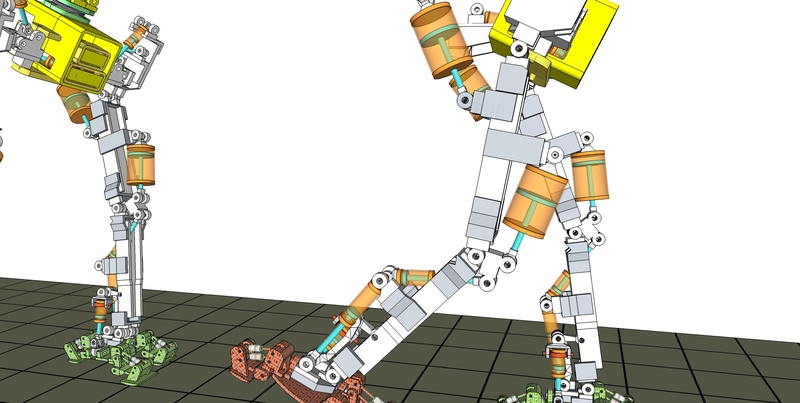 Notice that the right foot is back and will begin a sweeping forward as the robot goes to stance 15A. So here it is in stance 15A. This hip flexion piston has done all it can to move the right foot (and right leg) forward. The piston is basically fully extended. Ok, so I did a “trick” here that Sketchup will allow. 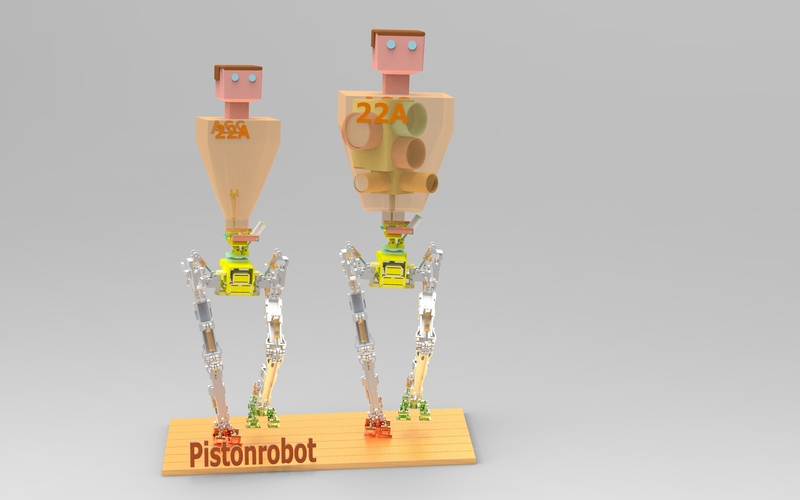 I selected the pistons of the right leg and copied them and placed them under the robot. Notice that I selected only the pistons and nothing else. Notice also that (for this discussion) I only selected pistons for the right leg, and I only did this for Robot Stances 14A and 15A. The purpose of this is that everything involved in trying to measure these piston motions is helped by any actions that tend to simplify what one has to look at and acts to bring into the view only the issues that matter. There are so many stances and so many pistons that it is very easy to get mixed up. This is an even more close up view of these pistons. Note that I have also added to the pistons a “measurement bar.” There is a measurement bar for each piston. These measurement bars simply show how far the piston head is away from the end of the cylinder. This closeup shows that I changed the coloring of each piston so that the coloring remained red for right and green for left. But I put a texture file overlay on the color where this texture file states which piston this is and which Robot stance it is. You may have to download this and enlarge it to see the writing of this texture file. 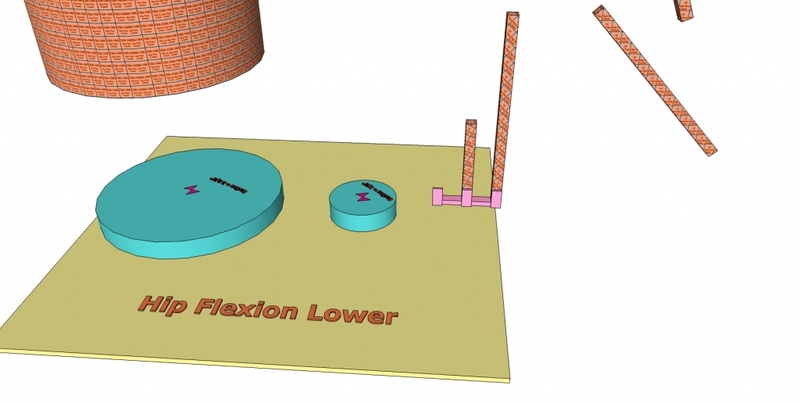 It basically says “hip flex lower 14.” The meaning of this is that it is the lower one of the two hip flexion pistons, and it is this piston for Robot Stance 14A. 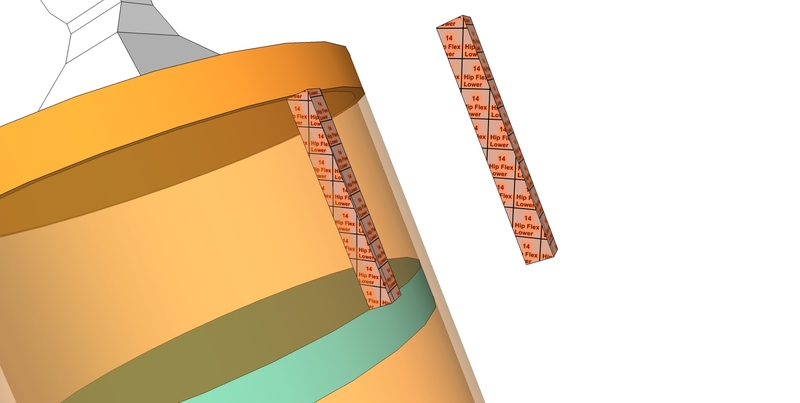 Now I am demonstrating how this measurement bar is created in Sketchup so that its length is the distance between the piston head and the cylinder. Note (once again) so that it is much less likely that I would get mixed up, that this measurement bar is red for right and has a texture overlay stating “hip flex lower 14.” Which means that this measurement bar is showing the distance from the piston head to the end of the cylinder for the Hip Flexion Lower Piston of the right leg for the Robot when the Robot is in its Stance number 14. You can see in this picture that I have shown some more of the right leg pistons. These are the pistons of Robot in Stance 15A. 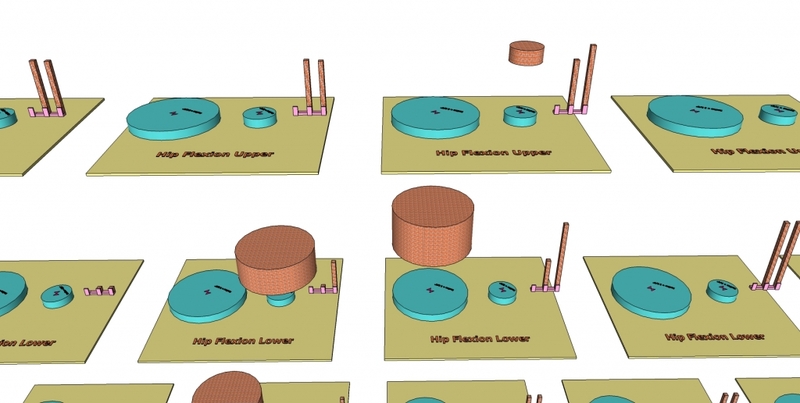 The pistons shown include those that cause rotation, adduction, hip flexion (upper and lower hip flexion pistons), and knee flexion (just showing the upper knee flexion piston only). The measurement bars are shown for these pistons. We have placed the lower hip flexion piston and its measurement bar in the center of the picture because this is the piston we are emphasizing in this discussion of how all this was done. Here we have an even greater magnification. We have used the copy feature of Sketchup again to make a copy of the Lower Hip Flexion 15 measurement bar and we have placed this copy next to the original measurement bar. Notice that both bars are kept in their orientation where their axes are congruent with the axes of the piston involved. 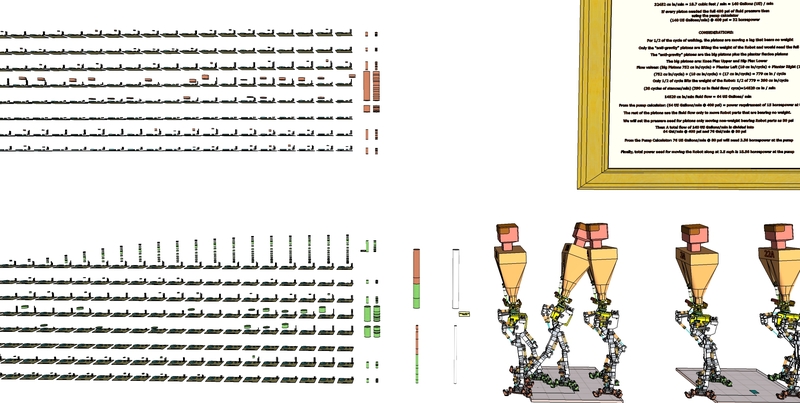 With this picture we are showing that the measurement bars for the Lower Hip Flexion Piston for Robot Stances 14 and 15 can be copied and moved (again using features of Sketchup). You can see that we created a plate type structure in Sketchup and we placed some blue-green cylinders on this plate. In addition, we placed an alignment structure (its pink in color) on the plate. 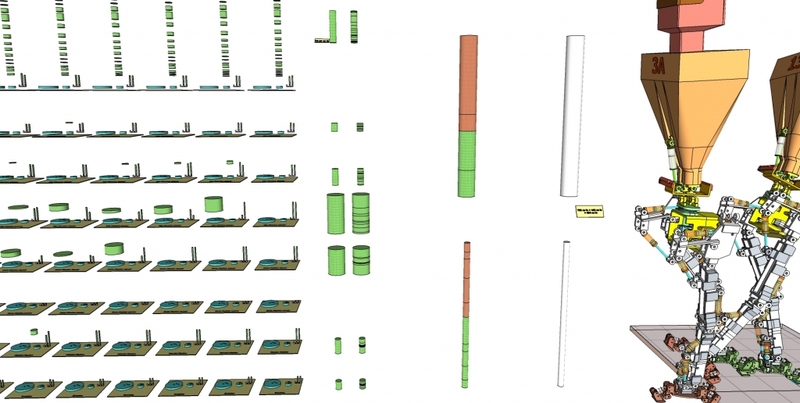 Again with copy and paste vis Sketchup, we can copy the measurement bars from Stances 14A and 15A and we can use another feature of Sketchup to pull the copied versions of the measurement bars down next to the pink alignment guide. Using Sketchup’s rotation feature, we can rotate a measurement bar along just one axis, and then rotate it again along just another axis, and one more time along the axis that is left. 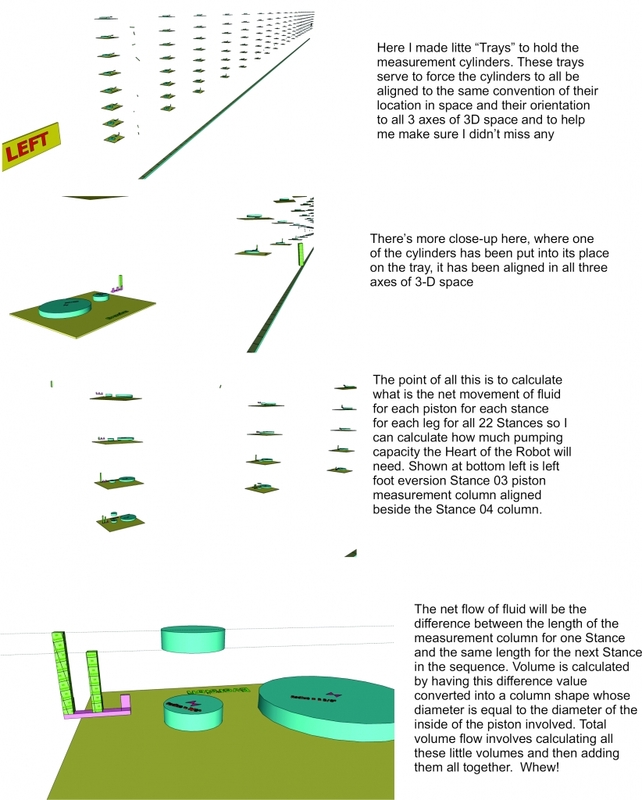 The effect of this is that the measurement bar’s axes are changed from being congruent to the axes of the piston that was used to create the measurement bar into the measurement bar having axes that are congruent with the normal x,y, and z axes of the Sketchup drawing space. If we do this axis re-assignment action to both measurement bars, then the effect is that the measurement bars are no longer aligned with the Robot Stance that they came from, but instead both measurement bars have alignment axes that are the same, and these new alignment axes are the normal alignment axes of the Sketchup drawing space. In this picture we have pulled the view back a little bit to show that the plate we are working with has a name, “Hip Flexion Lower.” In addition, the plate has 2 blue-green cylinders set onto the plate. 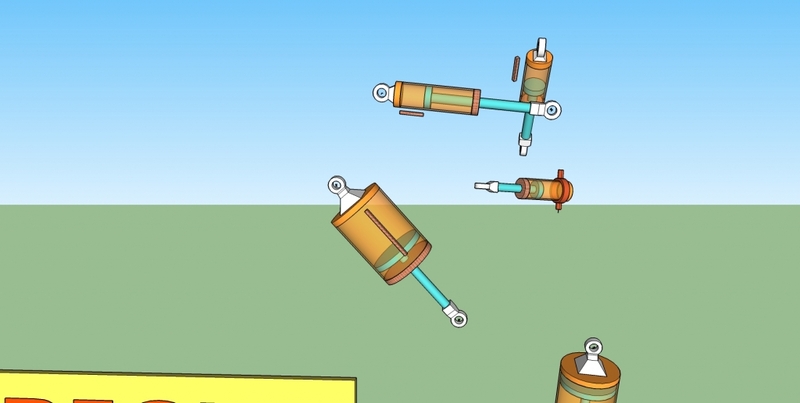 These blue-green cylinders have the diameters of the two types of pistons of the Robot. Some of the Robot pistons are 7/8 inch in diameter. Other pistons of the Robot are 2 3/8 inch diameter. These larger diameter pistons are located on the Robot in the positions where anti-gravity motions of the Robot need to occur. The larger diameter of these pistons allows them to create more pulling (or pushing) force, so they can lift the weight of the Robot against the force of gravity. The plate has an identifying label because there will be plates like this for all the different types of pistons of the Robot. 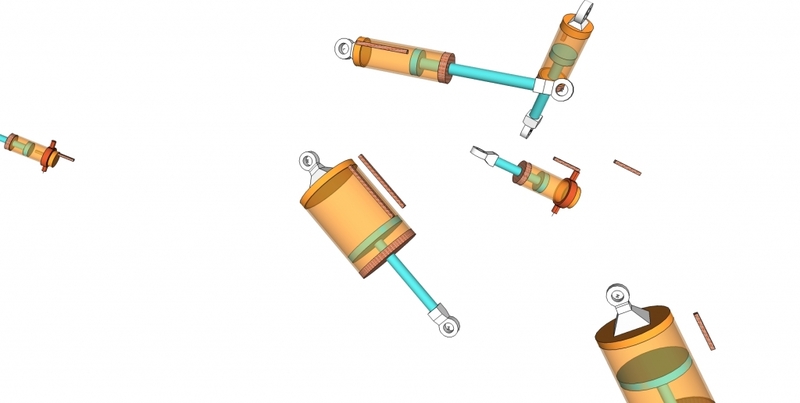 The listing of these different pistons is related to what action the piston causes for the parts of the Robot. Remember also that there is a set of these pistons for the right leg and another symmetrical set for the left leg. These piston’s names include: EVERSION (this piston makes inversion and eversion of the foot occur), PLANTAR (this piston makes plantar and dorsi flexion of the foot occur), KNEE FLEX LOWER (there are 2 pistons that cause flexion and extension of the knee, this is the lower of these two pistons), KNEE FLEX UPPER (this is the upper piston of the pistons that flex the knee), HIP FLEX LOWER (similarly, there are 2 pistons that cause flexion and extension of the hip, this is the lower piston of these two), HIP FLEX UPPER (this is the upper piston of the two pistons that cause hip flexion and extension), ADDUCTION (this piston acts to cause adduction and abduction of the hip), ROTATION ( this piston acts to cause internal and external rotation of the hip). This picture is the one that explains the whole purpose of what we’re doing here. (By the way, I didn’t like pic 16, so its gone, but it was too much work to relabel everything, so we just go from picture 15 to picture 17). The flow of fluid to a piston of the Robot is what causes that piston of the Robot to move from one position to another position. 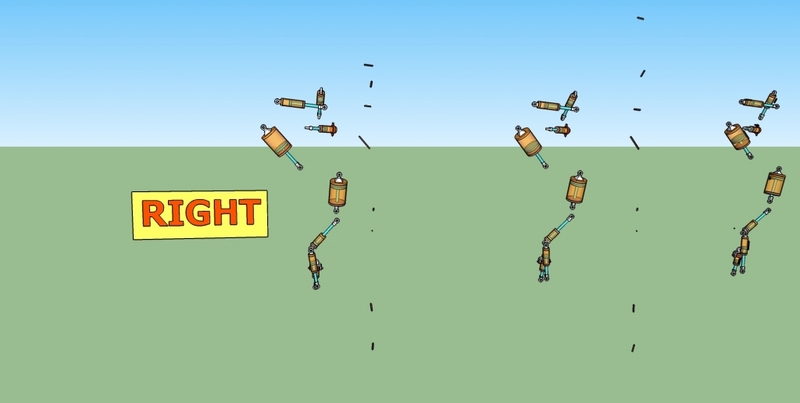 Since the various pistons of the Robot are connected to various structures of the Robot, then, when a particular piston of the Robot extends or retracts, then that piston motion will cause motion of a part of the Robot. 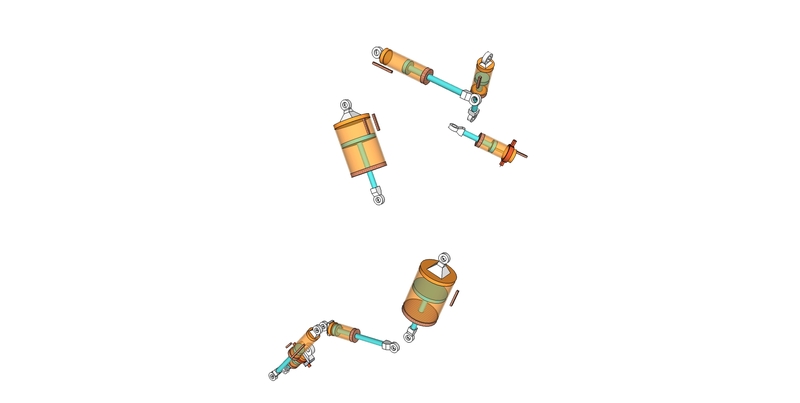 For example, we have been looking at the Lower Hip Flexion Piston of the Robot in the specific case of the Robot moving from Robot Stance 14A to Robot Stance 15A. The amount of fluid flow needed for the piston motion that occurs is easy to show via Sketchup because the difference in length of the measurement bar for one Stance compared to this same area of measurement for another Stance indicates how much motion the piston did. And since we know the diameter of the piston involved, then we can make a cylinder with diameter equal to the diameter of the piston involved and the cylinder will have a length equal to the difference in length between the two measurement bars. 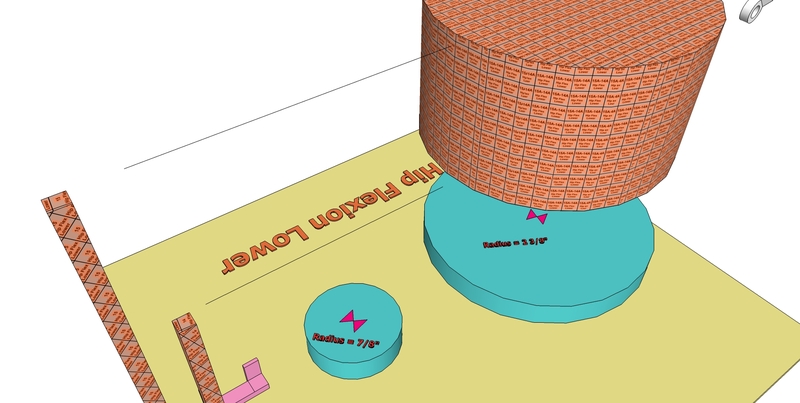 Specifically, as you look at this picture, the two horizontal lines show the length difference between the two measurement bars, and a cylinder is created in Sketchup whose length is this difference. 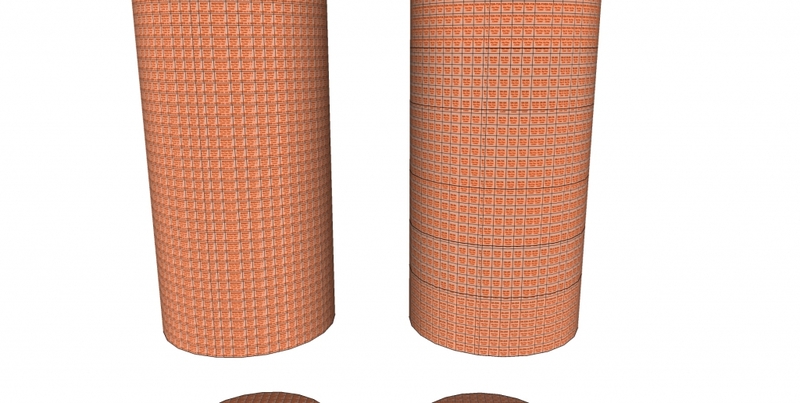 If this cylinder is set to be a “group” in Sketchup, then one can simply select the cylinder and Sketchup will tell you the volume of the cylinder. 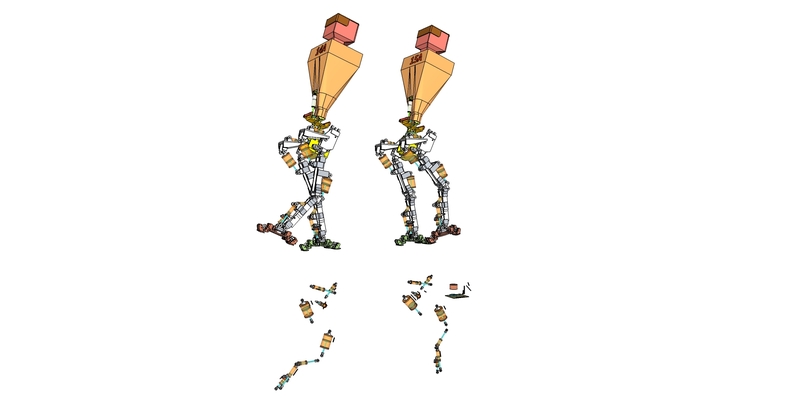 The effect of this is that we are showing you how much fluid volume moved in order to change the Lower Hip Flexion piston of the right leg of Robot Stance 14A into the Lower Hip Flexion piston of the right leg of Robot Stance 15A. With this picture we have a slightly more from the top looking down viewpoint. It let’s us show how we used the label on the plate to be sure we have the correct plate, we used the labels on the two measuring columns to compare the two stances at issue (Stance 14A and Stance 15A), and we set the cylinder showing the motion of the piston as being just over the blue-green reference cylinder on the plate to be sure we are using the correct diameter. 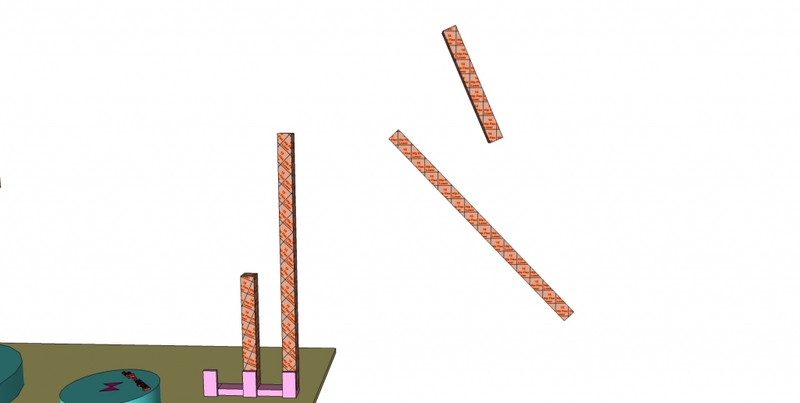 This picture just shows another view of how we altered the axes of the measuring columns so that they are both aligned to the axes of the pink reference structure. The only purpose of this pink reference structure is to have areas of corners that show all three axes. 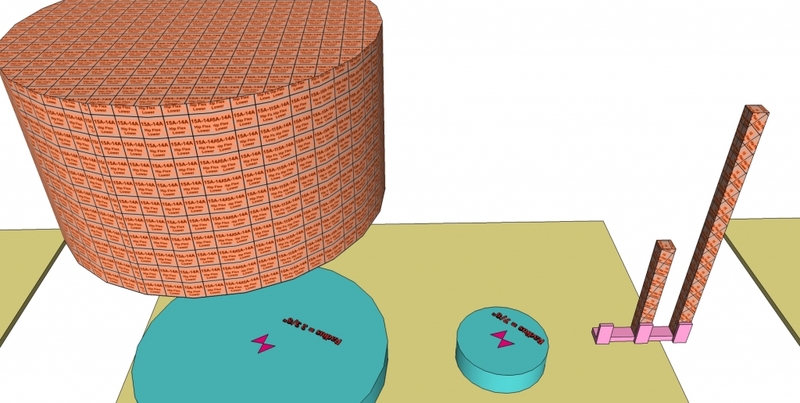 It should be noted that all the measurement columns were set to be 1/4 inch by 1/4 inch for their base size, and the pink alignment structure is 1/4 inch wide with little 1/4 inch “slats” sticking up. 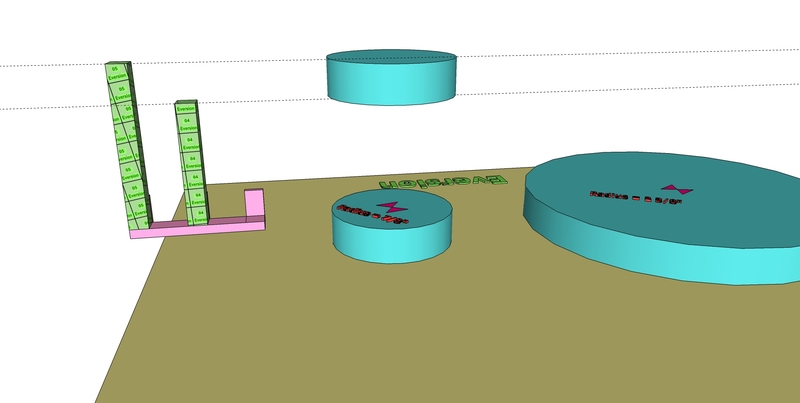 This type of alignment structure makes it very easy to use Sketchup to make a selection point on a corner of a measurement column, move this corner to a corner of the alignment structure and then use constrained rotation moves to bring the measurement column’s axes over to being congruent with the 3 independent axes of the measurement structure. We will now begin a process of pulling the point of view back to a wider and wider frame. This allows an appreciation of how all the piston motions can be measured, standardized, and used to show all the volumes of fluid movement that occur. Remembering that there are 8 pistons on each leg (16 pistons total) and there are 22 separate stances (total number of calculated piston flow values would be (16×22 = 352 separate plates shown). 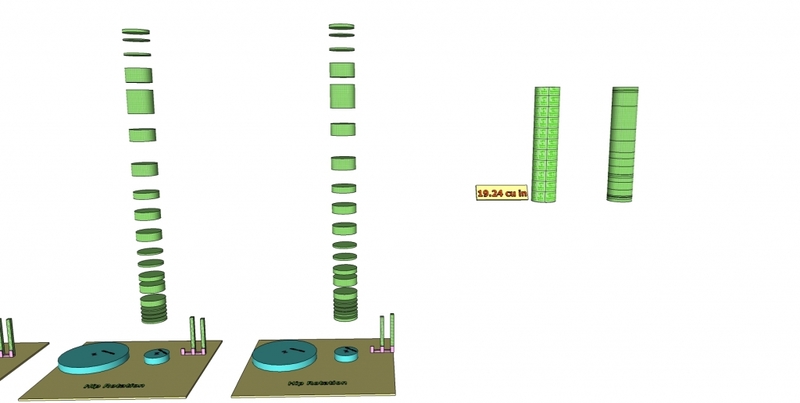 Note also, each plate includes the measurement column for that piston of that leg of that stance and also the measurement column of the stance just before, for a total number of measurement columns (352×2=704). 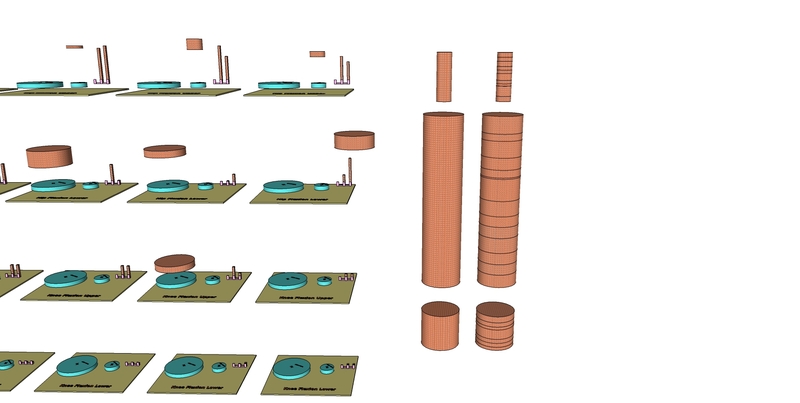 Finally, the difference between the two measurement column heights for each plate is used to create a cylinder for that plate which is showing the amount of fluid flow for that piston for that leg for that stance, (total number of fluid flow cylinders = 252). 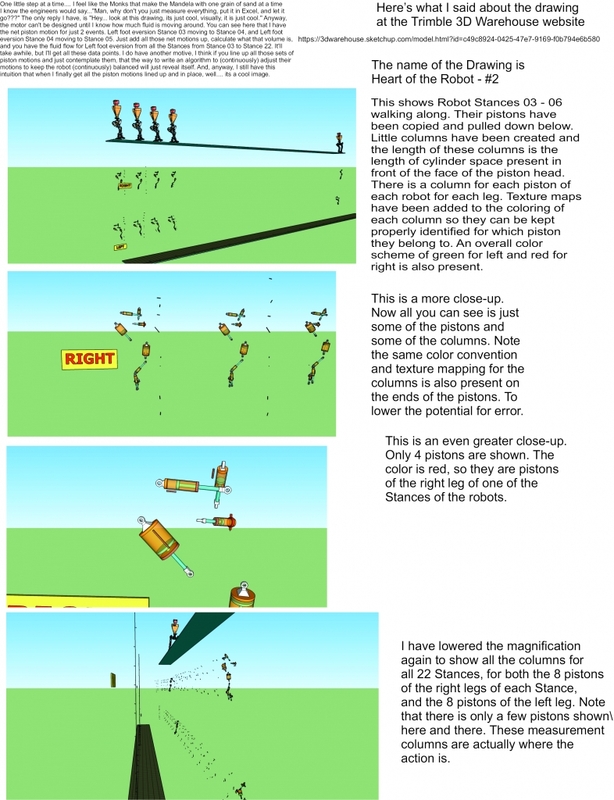 Except we should point out that there will be stances where a particular piston for a particular leg does not really move that much as the robot goes from one stance to the next stance. 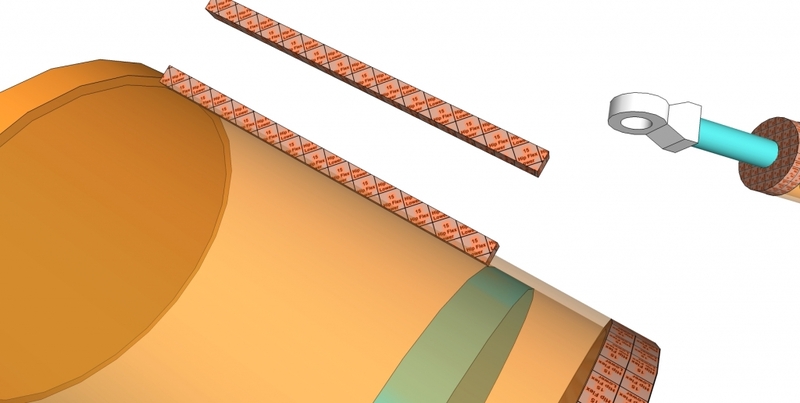 The effect of this is that there will be plates where no cylinder is present to show the fluid flow because the fluid flow was either zero or it was so small that there’s no need to include it. So we can see in this picture just how many plates there are and just how many piston motions occur. Notice that this is just the right leg. And notice (again) there are some plates with no cylinder showing a fluid flow (again) because either there was no net fluid flow or it wasn’t large enough to be shown. So we’ve backed the view out far enough to show the plates that represent the right leg piston fluid flows for all 22 stances. 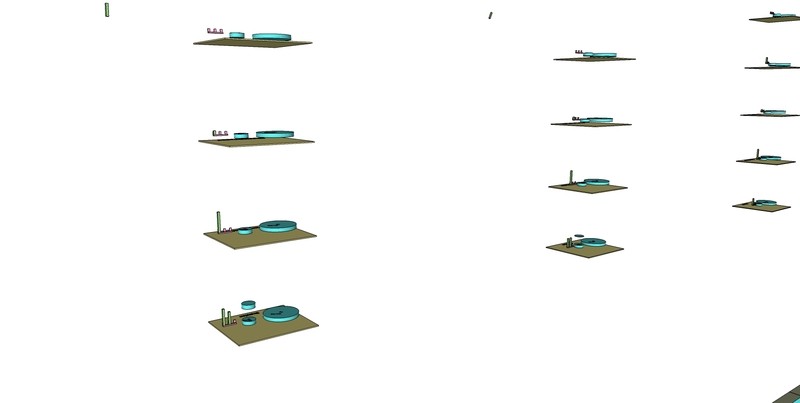 If one looks at the right of the picture, we are also beginning the process of “stacking” all the fluid flows on top of each other (using the copy, paste, move feature of Sketchup) so that we can start the process of totally the complete fluid flow numbers. Well, we’re trying to show how all the fluid flow cylinders for each separate Stance motion can be brought over and stacked on top of each other. We (once again) get into this issue that in order to really see what was done, one needs a very micro coned down magnified view, but in order to get the whole picture, one must then pull back and look at the whole picture. 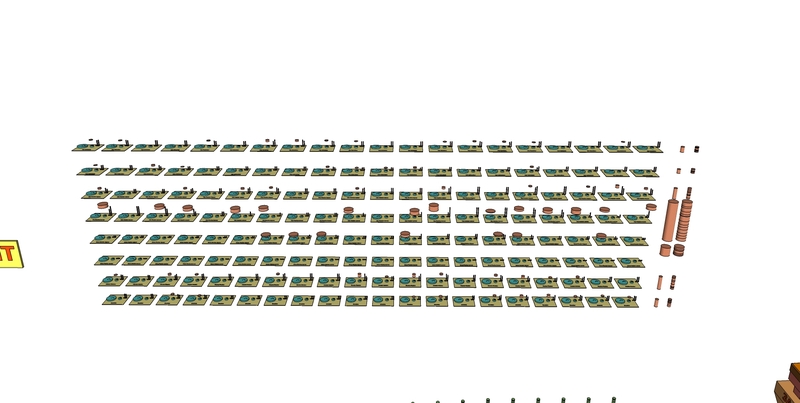 We will remind you that this cycling from (really unbelievable) magnification all the way out to a full view is very reliable and simple in Sketchup, and is nearly impossible to demonstrate with pictures of a size that they are reasonable for website pictures. 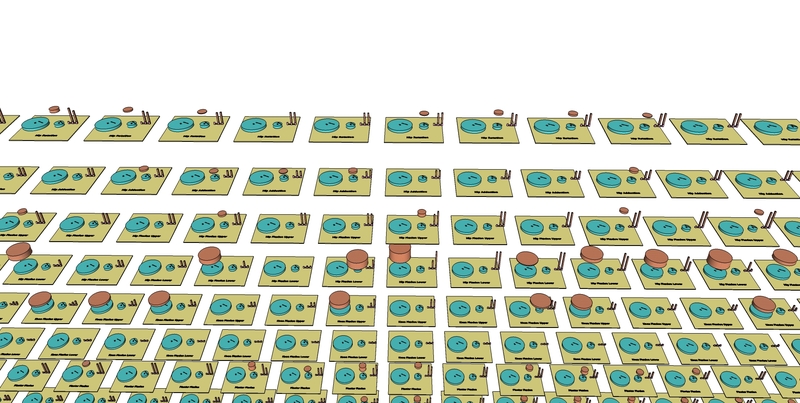 We remind you again that the actual Sketchup drawing files that were created to do all of this are up at the top of this page and you can download them. In addition, a sort-of good version of Sketchup is available for free and you can download the program and put it on your own desktop. 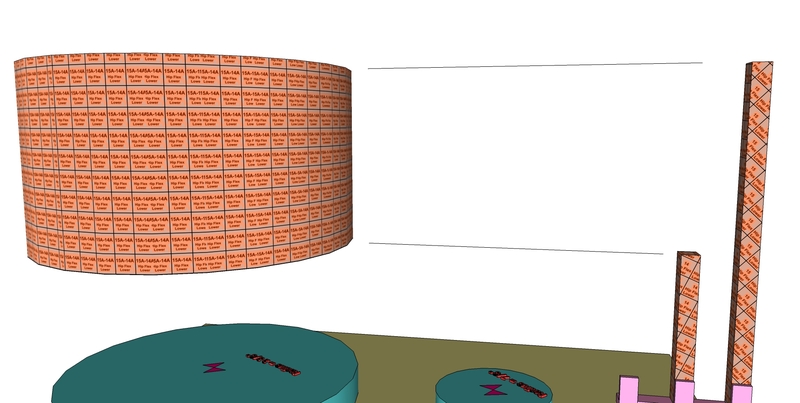 Here the column showing the totaling of the piston fluid flow is shown as it gets taller and taller as more individual piston’s fluid flow values are added in. With this picture we have brought the viewpoint over to the right and tried to include the final combined fluid flows. Note that there is a total fluid flow value shown for the smaller sized pistons, and one another for the larger diameter pistons. 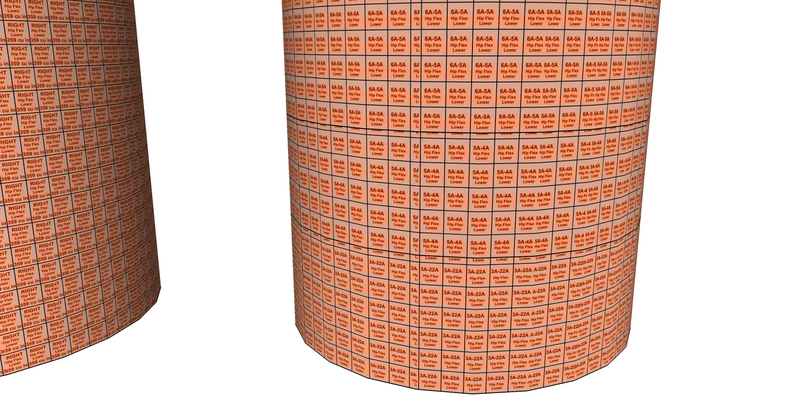 Note also, that in Sketchup these total combined cylinders can be made into a group, and when one “clicks” Sketchup on that group, then Sketchup will calculate for you what is the volume of that group. Again in this picture we have pulled back even further to let the picture show all the fluid volumes for all the stances of the right leg. And so, finally, we got the picture that shows the whole process. We made the decision that we simply had to break this down into 27 separate pictures, or, we feel, nobody would have understood what was being shown. This picture also demonstrates another very important feature. Throughout this process we took the various stances and pulled them far apart so that they had enough separation that we could just work on one stance and the individual pistons for that stance. 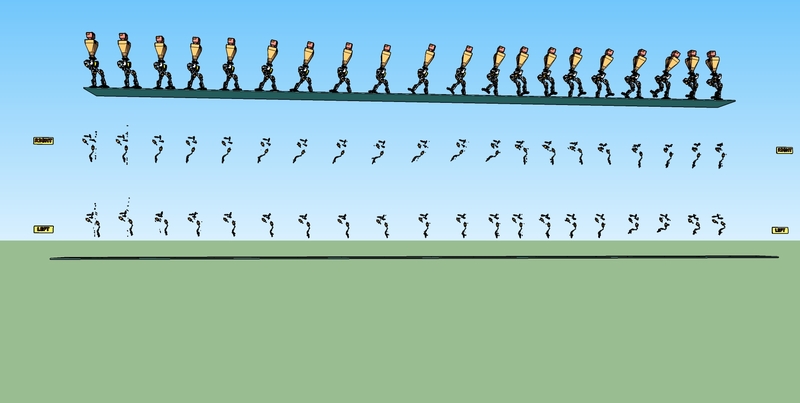 The actual Little Robot walking sequence is shown in this picture. 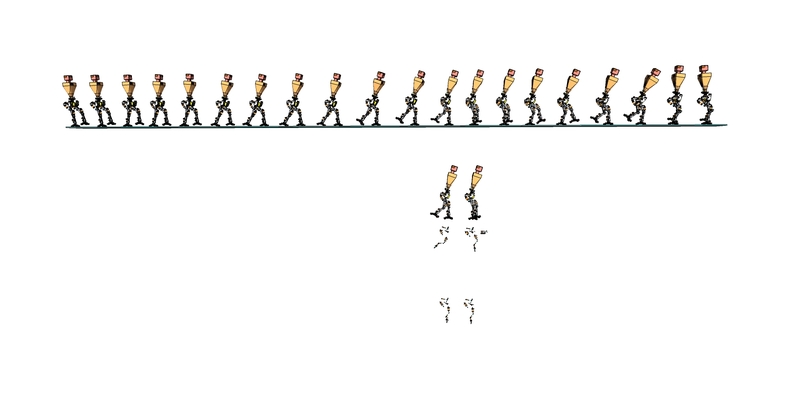 For the actual walking sequence, all of the stances are pushed very much together. 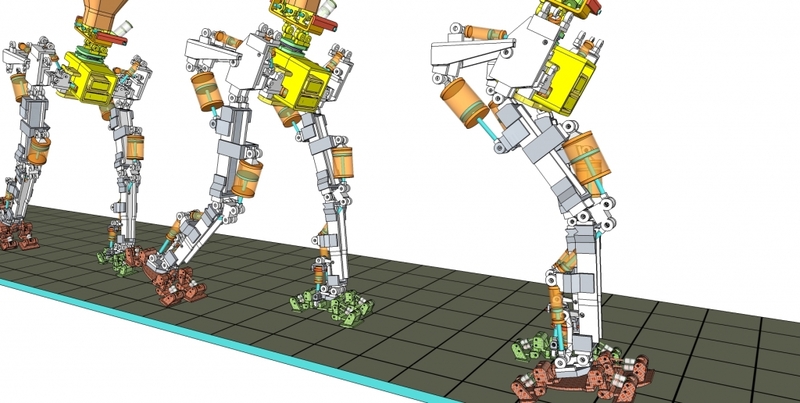 This makes mechanical sense in that if the right foot is placed at an arbitrary position on the floor (say on floor block one), then this right foot will stay exactly where it is on floor block one unless the weight of the robot is first transferred over to the left leg and left foot, so that the right foot is un-weighted. The right foot, even un-weighted, still does not move from its position on floor block one until the right foot is lifted up and then moved forward. 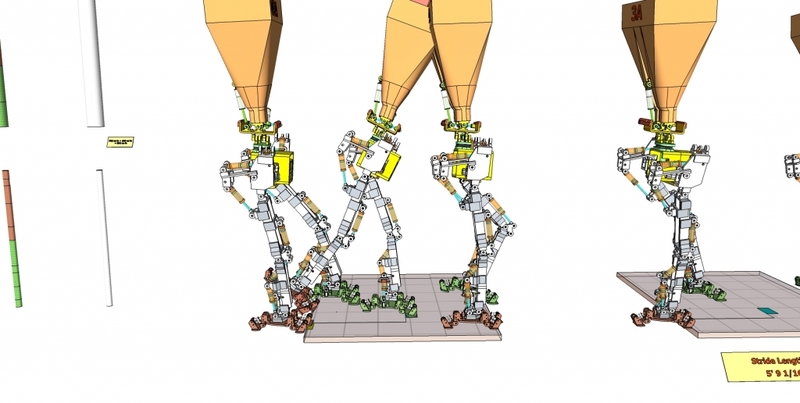 The effect of this is that many of the stances are using robot motion to get a particular foot so that it is un-weighted and can be moved. This means that for many stances, no net forward motion of the foot will occur. In addition, the stride length is only so long, it can’t be unreasonable. 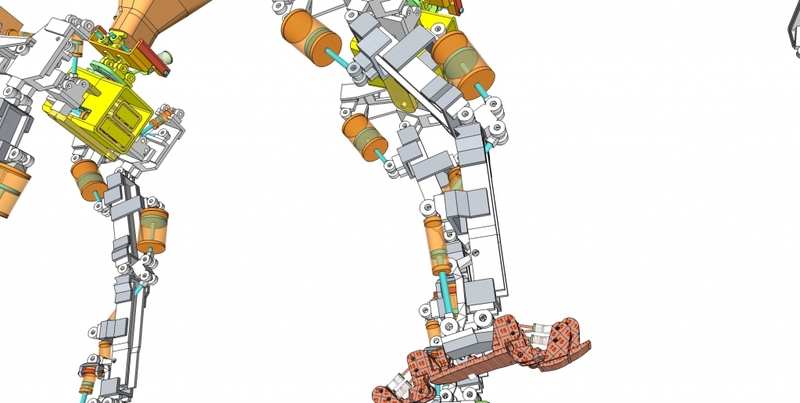 So any foot that is brought forward is only brought forward by an amount that is reasonable and tends to keep the robot balanced and under control. 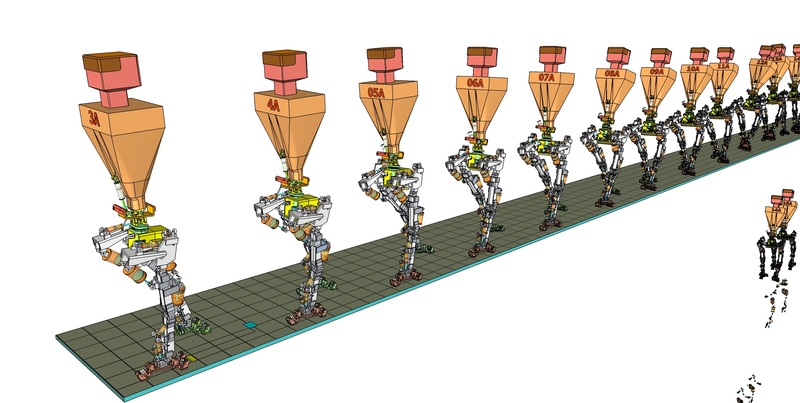 The effect of this is that with the spaced out stances the robot stances are shown as moving along on the floor, and as we go from stance 3A to stance 22A, the total motion moved along is 1616 inches. WOW ! 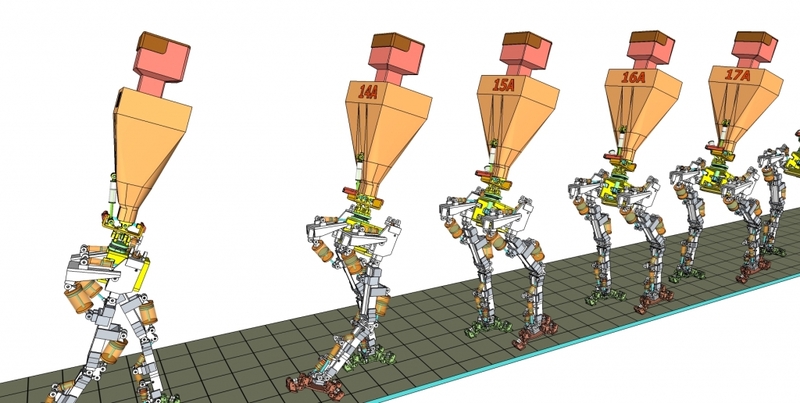 But the truth is that when the stances are placed in their actual positions of one cycle of walking, then as the Robot moves from Robot Stance 3A thru all 22 stances to Robot Stance 22A, well…. the robot has actually only moved forward by 69 1/16th inches. This travel distance per cycle of walking becomes important if one wants to calculate fluid flow rates per unit of time. 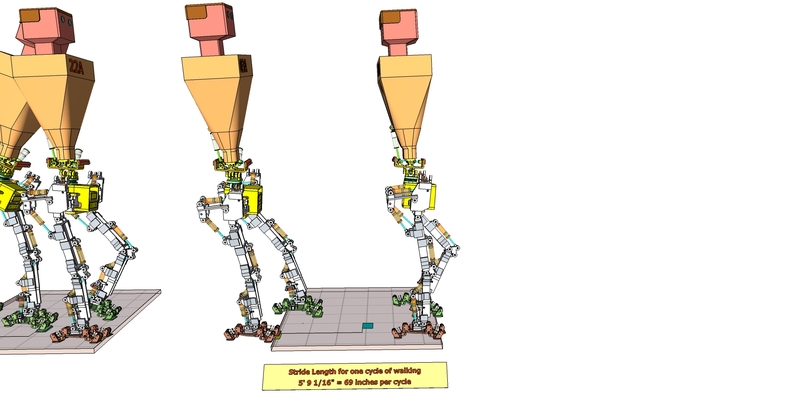 Surprisingly, there is yet another stipulation that must be added because we can’t work through fluid flow rates if we don’t know how fast the robot is walking along as it does its cycles of walking. 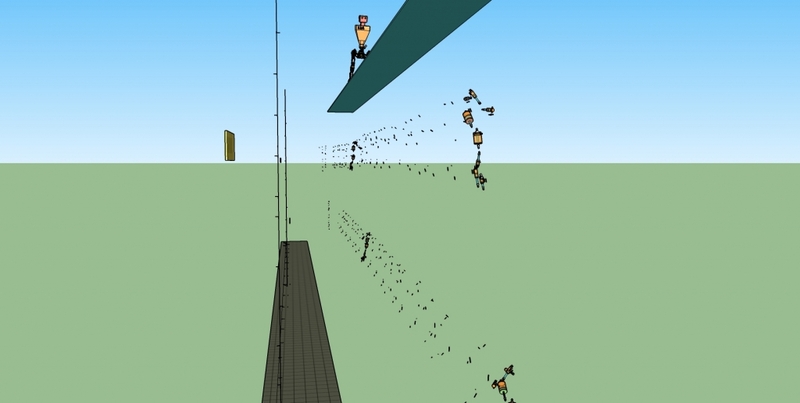 This problem does not suit itself to just using math to get the answer because pure math will not really force any particular speed of walking on the robot, except some upper limits of how much force the robot’s parts can take as one accelerates the parts more and more. I feel the upper mechanical limit on the forward speed of the robot is way in excess of anything we would care about. I chose instead to look at what is the purpose of the Robot anyway? And, sigh, from a budgetary viewpoint, while this robot is really cool, there really is no person or group with sufficient funds to create it and get it to work except governmentally controlled financing. So I chose just soldiers walking along, not really showing off, or doing some sort of forced quick march, or doing parade or ceremonial walking or marching. Instead, I chose just the soldiers walking along to try to get somewhere so they can do their soldiering work. If one looks around on this topic, the walking speed of 2.5 miles per hour comes up. So I chose that speed, and, once that value is available, then all the rest of the calculations can be done.